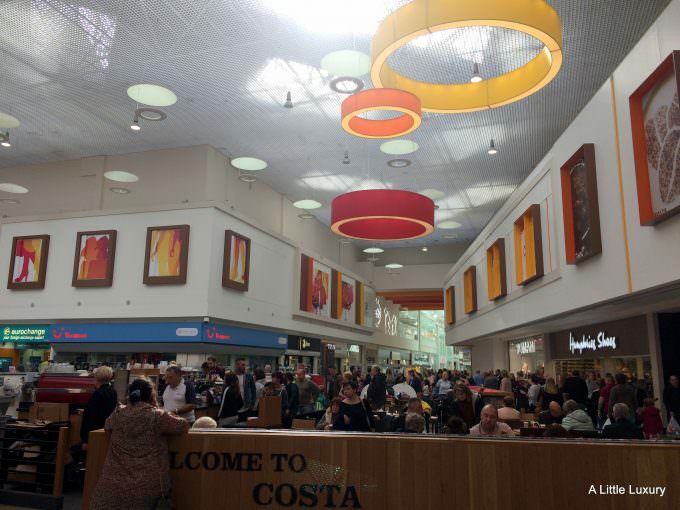 Last weekend we were invited along to the Kingfisher Shopping Centre for an experience day. Now I’d never been to the centre, although it’s actually very easy to get to. We went by car and it was a very easy drive with lots of choice for car parks (if anything I was spoilt for choice and wasn’t sure which would be the best one for me). A friend said they liked to visit by train, which is easy too as Redditch is on the cross-city line that runs through Birmingham. Inside it was much bigger than I expected. It was bright and airy with lots of shops. We wandered around a number of the shops and I was impressed by the size of them and the range. The Debenhams was quite a big store and as luck would have it they had 20% off a lot of lines, so I was able to get a bargain. Meanwhile Hawkins Bazaar was popular with my companion for the day. Still I’m getting ahead of myself, we weren’t really there with shopping in mind, although it did form a part of our day, we were there to have some fun. First off we went to Perfect Nails and Brows. It was very busy and there were clearly lots of regular clients. The service was friendly and efficient, plus the staff are skilled at their jobs. I had my nails done with a gel polish and I was very happy with the results. In fact, today almost a week later I am still very happy with the results as the finish is still near perfect. I’ve already recommended it to a friend who goes to Redditch regularly. 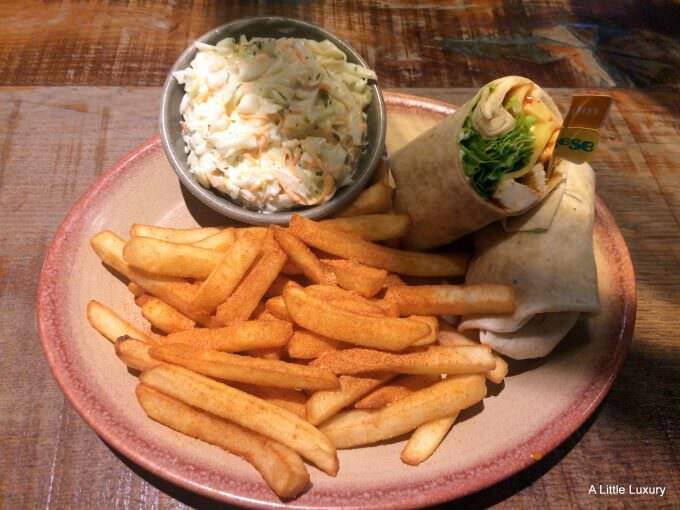 Next up we went to Nando’s for lunch. Nando’s was very popular, but everyone who turned up at the door was quickly found a spot. We were looked after by friendly staff and had a enjoyable meal which set us up for the day. 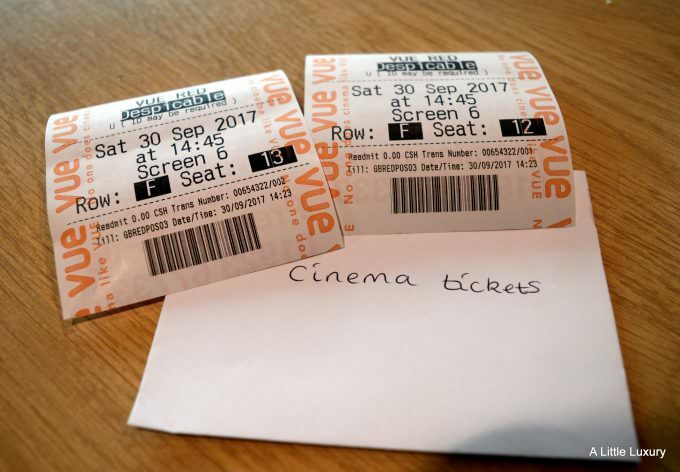 After a leisurely meal we strolled over to the Vue Cinema to see a film. I’d taken a very patient 10-year-old along with me when I had my nails done, so it seemed only fair he should choose the film: Despicable Me 3. I loved the fact that we found so much to do at the Kingfisher Shopping Centre. I’d not thought of having a day out there before, but I’d certainly consider it again. There are plenty of eating places in The Hub and the cinema too, plus there’s even a play centre for the kids. 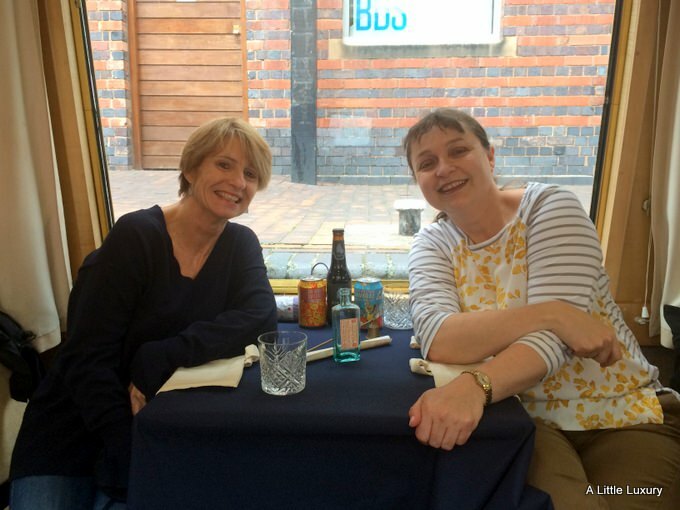 I was invited along to try the cuisine at Tamatanga on Navigation Street in Birmingham. 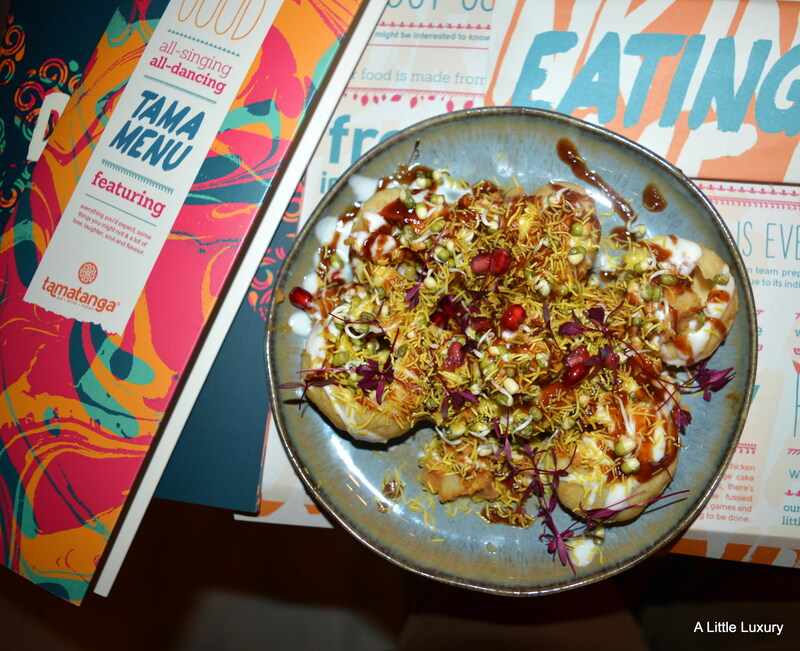 Obviously here in Birmingham we are well endowed with Indian restaurants, so I was keen to see if Tamatanga could add something new to the mix of Indian dining establishments. The decor is the first thing that strikes you as you go into Tamatanga. As you can see it’s quite striking and not what you expect from a traditional curry house and that’s because it’s not, so don’t expect to find any flock wallpaper here. It’s a very modern vibe and generally very comfortable, although the seating in our section was either a little too big for the area, or maybe it needed one less table as it was a little difficult for the waiting staff to get past as the restaurant filled up. I really liked the colourful look and I think it made it clear that the food here was going to be a little bit different and certainly have a modern twist. We started the evening sampling the cocktail menu. 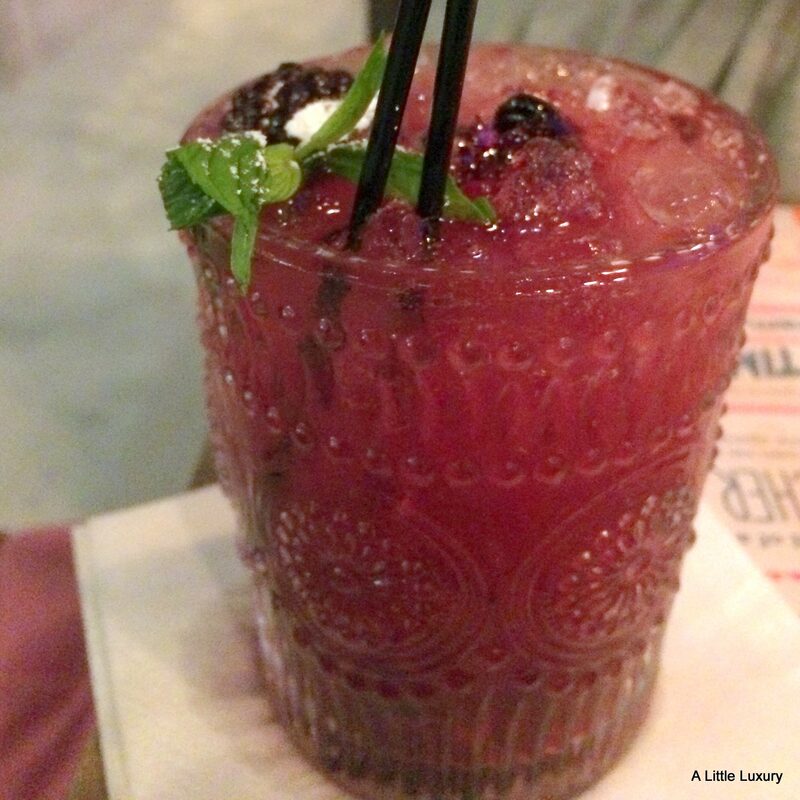 I do find that cocktails go nicely with Asian cuisine and generally pick something long and refreshing to drink like this Berry Bombay cocktail made from vodka and pink lemonade with plenty of berries. There’s plenty of choice on the drinks menu including a range of craft beers including Tailgate Peanut Butter Milk Stout which I wish I’d spotted earlier as I’d have liked to give it a go. 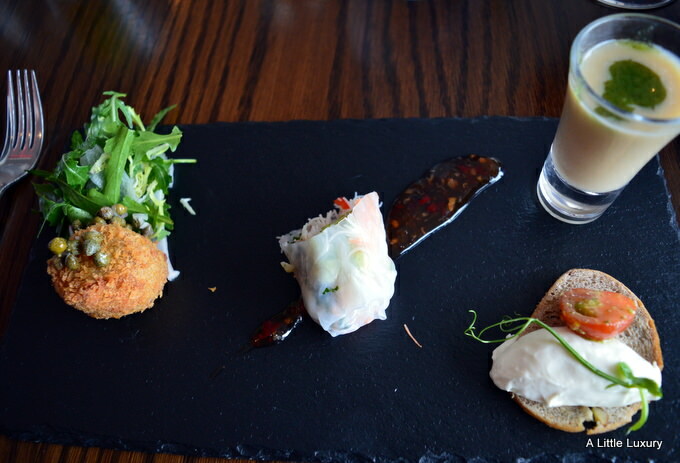 We tried a range of starters including the delightful chaat bombs. These are crisp bread puffs that are filled with chickpeas, sprouts,spiced yoghurt, tamarind & coriander and topped with home-made vermicelli. Crunchy, fruity, mildly spicy: very much my idea of a good starter and very colourful with the pomegranate garnish on top. For my main course I picked out the Tamatanga Salmon and I wasn’t disappointed. It was wonderfully moist and aromatic. It’s a salmon fillet that’s cooked with a light and fresh blend of tamatanga’s spices and served with their in-house tamatanga chutney. I certainly think I’ll be going back to Tamatanga, in fact I think my 10-year-old would enjoy the style of the place and the kids’ menu is a little bit different, which I think he’d like. 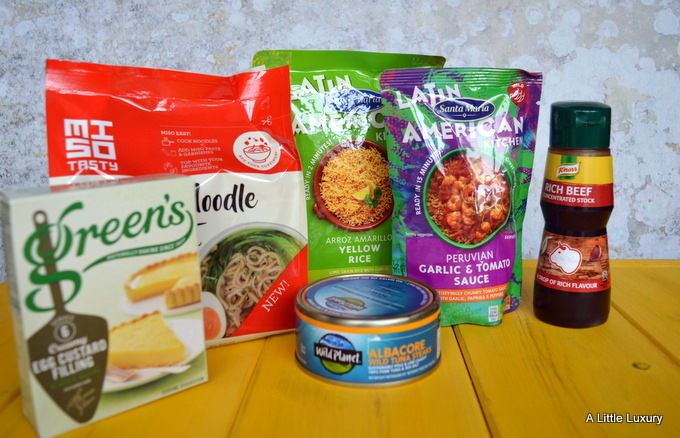 As ever lots of goodies in this month’s Degustabox. I’d never thought of making my own egg custard, but Green’s Egg Custard Mix makes that easy. Another thing that makes cooking easy is this Knorr Concentrated Stock which is perfect for adding to stews or bolognese sauce to add extra meaty flavour. Wild Planet Albacore Wild Tuna Steaks are ranked number one in the US by Greenpeace for sustainability which is good to know. I try to make sure all my fish comes from sustainable sources. 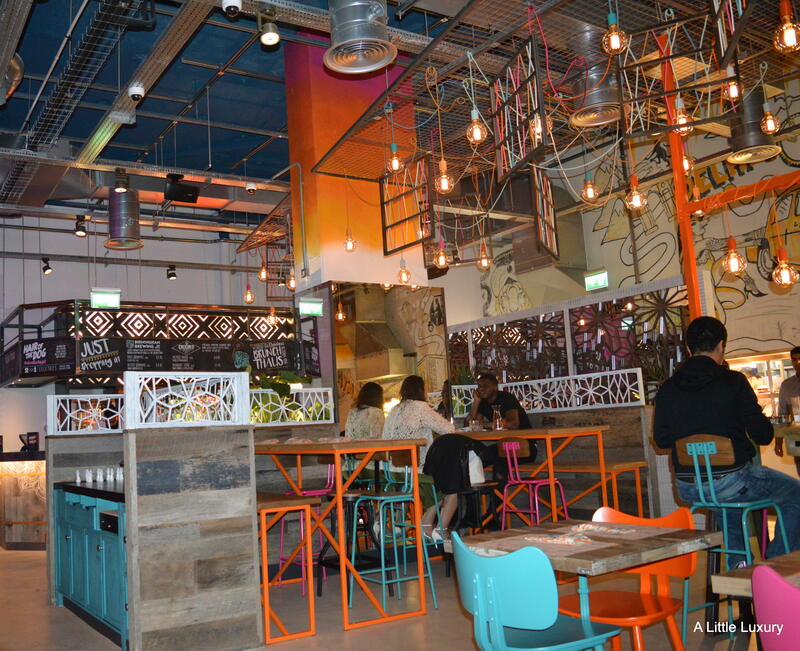 Latin American Kitchen by Santa Maria is the perfect thing for those evenings when you need to prepare your food fast. There are five different flavours of rice and five different flavours of sauce to choose from, so there’s plenty of variety. I’d never really thought about beer having gluten in it, but this San Miguel beer is gluten-free, which is great for those who enjoy a beer and have problems with gluten. Cheerios Oat Crisp makes a crunchy start to the day and it contains beta-glucan from oat fibre which is good for the heart as it helps reduce cholesterol. It’s good that there is such a range of dairy free alternatives to milk now. In this Degustabox we get to try Dream Ancient Grains made from a blend of oat, spelt, buckwheat and linseed. I have a full value voucher to try out Seriously Spreadable Squares which are great for picnics or lunch boxes and they are made from tangy Scottish cheddar. Virtue Energy Water is a naturally sugar-free energy drink with the same amount of natural caffeine as a cup of coffee. 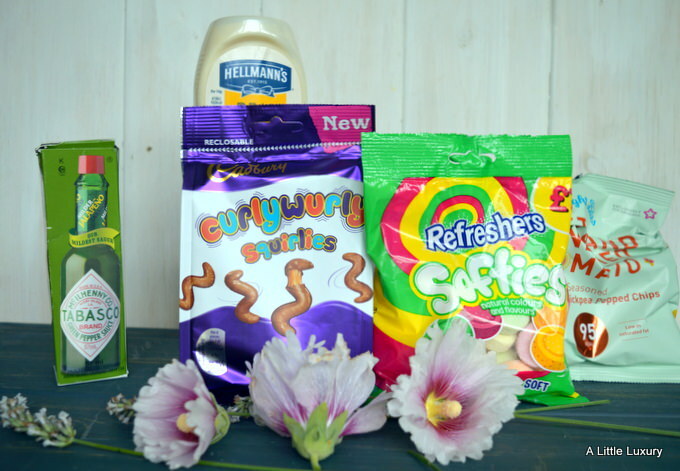 Some lovely treats too in this month’s box like the Mentos Mint Mix Sharing Pouch and the Green & Black’s Velvet Edition (I’m not prepared to share that one). We decided to try out a balti house in the famous Birmingham Balti Triangle. For those not in the know, the word ‘balti’ actually refers to the bowl that the dish is served and is thought to originate from the Urdu word balty, meaning ‘bucket’. There are balti houses all over the Greater Birmingham area, but there is a real concentration in the Balti Triangle, also there’s a very Asian atmosphere with lots of shops selling Asian produce or clothing too. 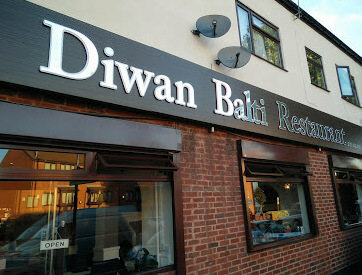 We picked out the Diwan Balti because it was on the nearest edge of the triangle to us and looked very promising. It turns out that we weren’t the only ones who thought so as there were quite a few people in there for early on a Friday evening and it turns out that David Cameron had been there in the past. Apparently David Cameron and his wife Samantha celebrated David’s 46th birthday at the restaurant and you can even order the same complete meal as him as it features in a special section on the menu. We started the meal with some popadoms whilst we mulled over our choices from the menu. The service was quick and attentive. We asked for some starters to be served with the main course and others as starters and all was accomplished as we asked. We sampled a seekh kebab, made from minced lamb mixed with onion, herbs and spices, cooked in a charcoal oven on skewers. 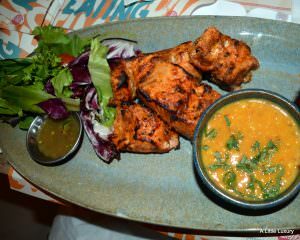 Also on our wishlist was the chicken tikka and the tandoori chicken (young spring chicken marinated in yoghurt with herbs and spices, barbecued in a tandoor) and both of these had the delicate spicy taste that I’ve come to expect. For our main course, we had to have a balti of course. It’s traditional to eat your balti without using a knife and fork and to just tear off pieces of your naan bread to scoop the food onto. It works very well, but I must admit I prefer to have my balti with a portion of rice mixed in and then share a naan bread with a friend. This is just what we did. Having had a chicken starter, I thought a lamb balti would be just the thing for my main course. It’s a medium strength curry, but you can ask the restaurant to tone it down or spice it up to suit your taste buds. I find baltis have quite a light sauce which doesn’t sit too heavily, which is just as well as the portions were generous and the naan was pretty large given it was meant for one. That said it was quickly snaffled up and in fact, I hadn’t anticipated that my son would eat quite so much of it, or I would have ordered two. 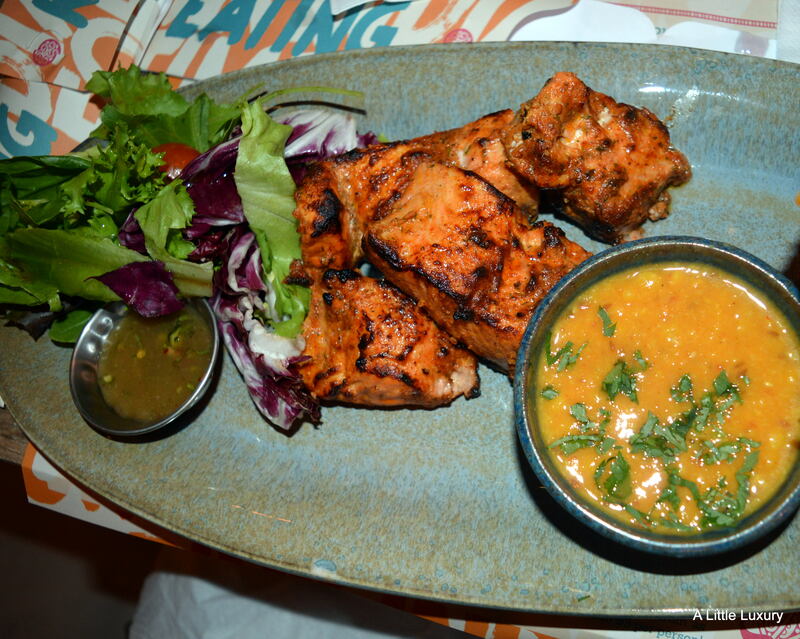 Travelodge kindly sent us along to try out a restaurant in the Balti Triangle and if you are staying in Birmingham and like Asian cuisine, a trip to the Balti Triangle is a must. Disclosure: This post is in association with Travelodge. Miss Saigon is one of those big West End musicals that everyone should take the opportunity to see at least once. 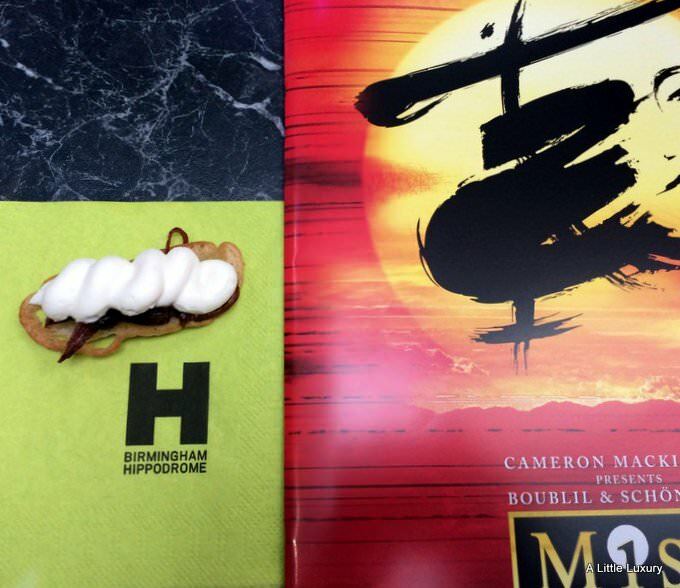 I was invited the the Birmingham Hippodrome to see the famous show and sample their special menu themed around the musical’s Eastern setting. I’d really recommend this approach because it makes for a very special evening and a complete experience. 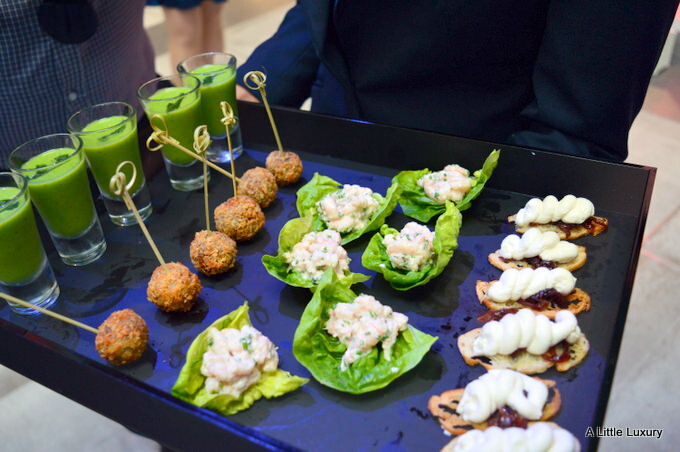 We started off the evening with some canapes and a lovely fruity Miss Saigon cocktail. We got to try all 4 of the starters on the special menu which was a real treat. There was White Bean Soup with Basil Pesto which was silky smooth. I think my pick of the bunch was the Vietnamese Prawn Summer Rolls with Sweet Chilli Sauce as for me these were light, but packed with flavour and everything was cooked just right which takes a bit of doing when you are dealing with such a mix of ingredients. My second best (and it was quite a close call) was the Salt Beef Croquette with Salad of Mooli, Shallots and Capers. I loved how the capers cut through and provided a zest and freshness to this dish. I also enjoyed the Goat’s Cheese Mousse with Marinated Tomatoes and Walnut Toast, but I didn’t feel it sat quite so well with the evening’s theme. I loved getting the opportunity to try out the mini mains. It was quite difficult to pick out a favourite. I enjoyed the Pan-Seared Fillet of Coley with Rice Noodle, Samphire, Ginger and Spring Onion Broth, but I think my top choice would be the Honey-brushed Confit of Duck Leg with Celeriac Puree, Bok Choy and Star Anise Jus as it was packed full of deep duck flavours with the celeriac providing a good foil. 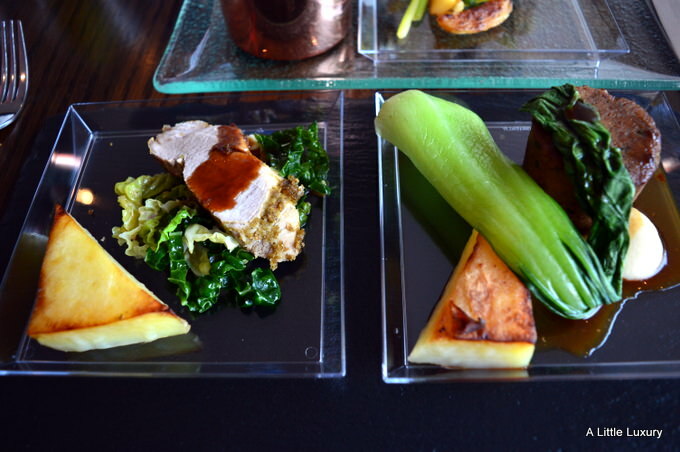 Another favourite was the Chilli & Coriander Crusted Pork Tenderloin with Soy & Sesame Braised Savoy Cabbage, which combined tried and tested British flavour combinations with Asian spices. The Yellow Curry Lentil Scotch Egg with Asparagus and New Potato Salad was a bit of a revelation as I would never have picked a scotch egg to order off the menu, but I did enjoy it. Off to see the musical where we spent the first half enjoying the developing love story of Kim and Chris against the backdrop of the Vietnam war. At the interval we had our desserts. I’m afraid the Matcha Green Tea Panna Cotta with Kalamansi and Sesame Tuille, but I’m not very keen on matcha tea and I think that flavour didn’t help make it a winner for me. 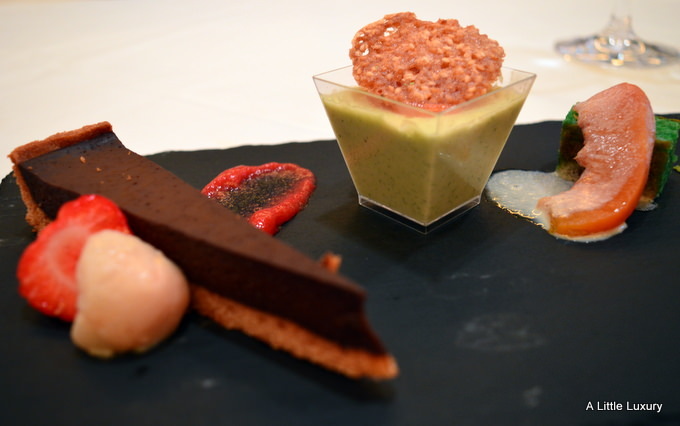 I enjoyed the Poached Peach and Pistachio Cake, but for me the stand out was the Bitter Chocolate Tart with Lychee, Strawberry & Mint Compote. The chocolate tart got the perfect balance between bitterness and sweetness, plus you could clearly taste the quality of the chocolate that had been used to make it. Back to the musical for a dramatic, if very sad, second half where I learnt a lot of about the aftermath of the Vietnam War and the children left behind. An evening to remember. 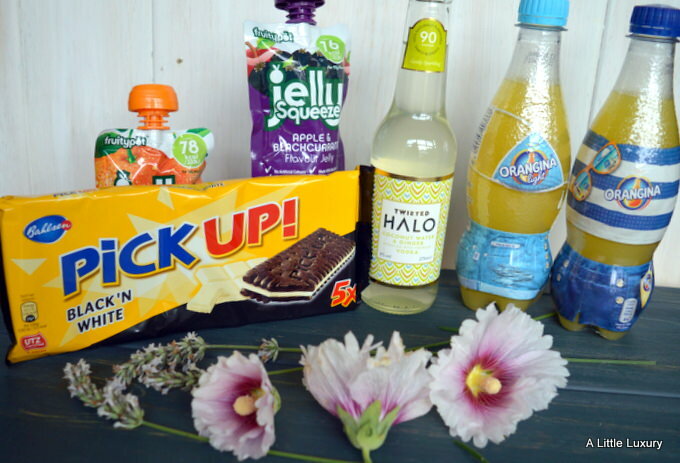 I look forward to my monthly Degustabox delivery: there’s something about being surprised and there’s always something new to try. This month’s went down very well. In fact, I barely saw the Orangina before it was whisked away as refreshment for a trip to the park. My son really enjoyed it. He did leave behind the Twisted Halo for me to enjoy. This flavour was Coconut Water, Ginger & Vodka and all the flavourings are natural and there’s no added sugar or sweeteners. It’s very refreshing and best served chilled. My niece and nephew loved the JellySqueeze and are keen to have it again. It’s a great lunchbox treat. The Bahlsen PICK UP! Black ‘N White are a delicious update to a favourite snack: a white chocolate bar sandwiched between two crisp chocolate flavour biscuits. As you might expect from a household with a child in it, the Refreshers Softies were greeted with enthusiasm: my son is a big Refreshers fan. We both loved the Cadbury Curlywurly Squirlies in a handy shareable bag. The Cadbury Dairy Milk Big Taste Toffee Whole Nut was all mine though and very moreish. Light Bites Popped Chips are great for snacking without piling on the calories as they are under 100 calories a pack. They’re also gluten-free and there are no artificial colours, flavours or preservatives. The Hellmann’s Real Mayonnaise is a really useful store cupboard ingredient, but I must admit I prefer the jars to these bottles. Tabasco Green Pepper Sauce is the mildest variety in the Tabasco range, so this is a bit of heat without blowing your head off. I do like a crinkle cut crisp and Seabrook Crisps are very tasty. A selection pack is always useful because not everyone likes the same varieties. Maggi Fusian Noodles are a great way of getting a quick and tasty noodles: they are ready to eat in just 4 minutes. This year has been a bit of a struggle gardening wise. I’ve been having some problems with my right arm which I initially thought was a muscle strain, but I know think might be tennis elbow (not that I’ve been playing any tennis). There have been lots of plans, not enough time and the arm problem, so I haven’t had the chance to give the garden the help it really needed. 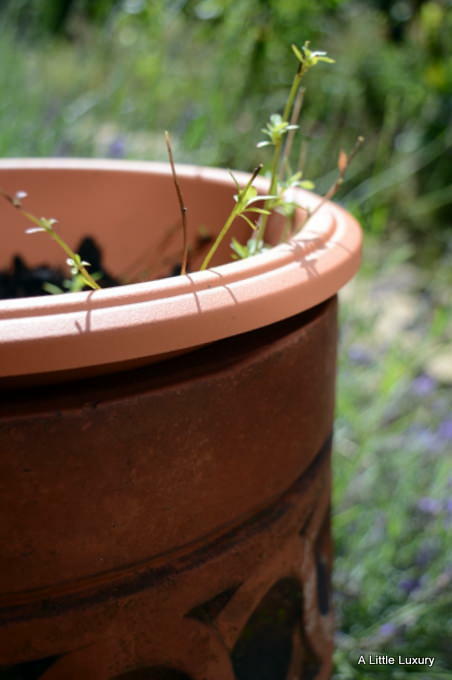 It was a bit of a relief when Scotts Miracle-Gro® got in touch to suggest some ways of achieving results without having to put a lot of effort in. In fact, Scotts Miracle-Gro® company has created the Extremely Busy and Important Person’s Guide to Gardening. Designed as a parody of the best-selling Ladybird Books for Adults and world-renowned range of gardening guides from famous author and botanist Dr D.G. Hessayon, the guide, available as a free download at www.lovethegarden.com/littlegreenlies, breaks down garden care into three key simple-to-follow areas: lawns, plants and weeds. I decided that the top priority was to improve the look of the house from the front. 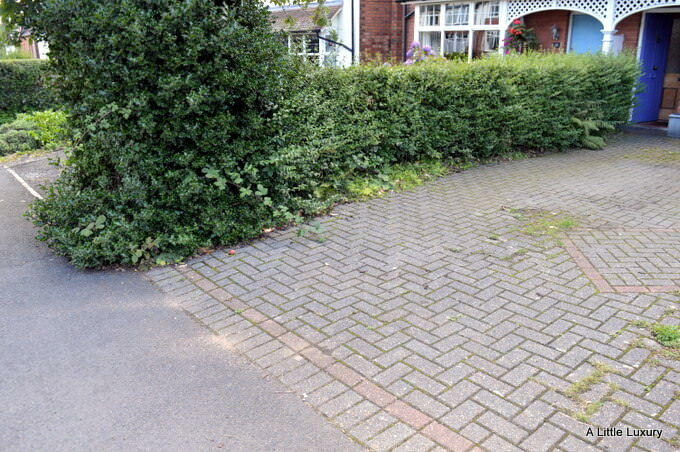 The hedges needed cutting and the drive was a disgrace. 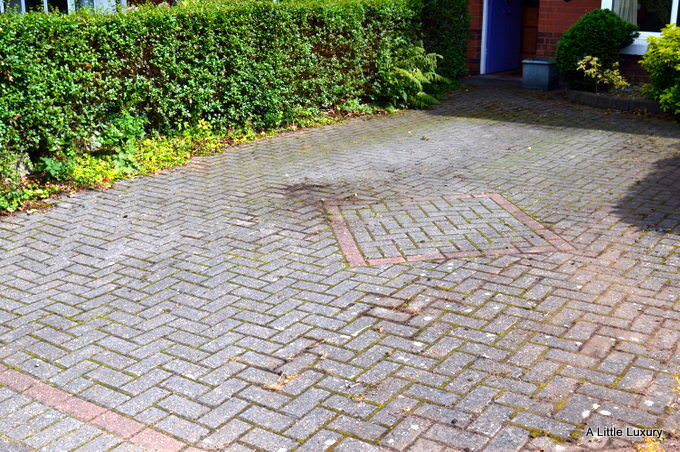 Really it needs a good go with a pressure washer and sand brushing into the cracks, but instead I decided to use Weedol® PS Pathclear™ Weedkiller. Weedol® PS Pathclear™ Weedkiller kills weeds to the roots and creates an invisible barrier that prevents new weed growth for up to 3 months, which seemed just the thing to save me having to redo the job this year. I used the 5 litre Weedol®PS Pathclear™ Power Sprayer, which comes with a battery operated power sprayer for continuous spray and extended reach for optimum accuracy (the 4 x AA batteries come included too). So I got the car off the drive and sprayed everywhere. It didn’t take that long, say 20 minutes if that. Over the next couple of weeks the weeks started to die off. Then I gave it a bit of a brush over and tidy up. Hopefully, you can see in this after picture that the weeds have died right back and the whole area looks a lot more tidy. It inspired me to have a go at making a bit of a focal point by creating a feature. Not wanting to put anything to waste, I decided a bit of recycling was in order. 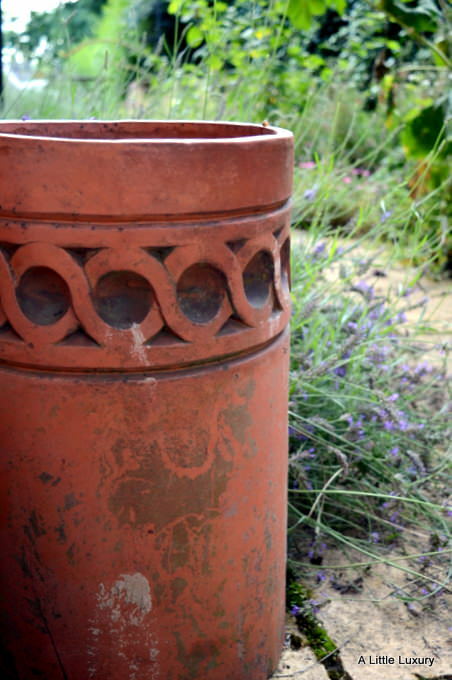 This old chimney pot didn’t go back on the roof when some work was done a few months ago. It’s not as pretty as the old style Victorian ones, but I think it’s quite decorative. I’ve been looking around for the right thing to go in there and I’ve decided on some Mexican fleabane. I’ve put a plant pot inside it and it’s held up by a tower of old bricks inside. It doesn’t look anything special at the moment, but I have high hopes. 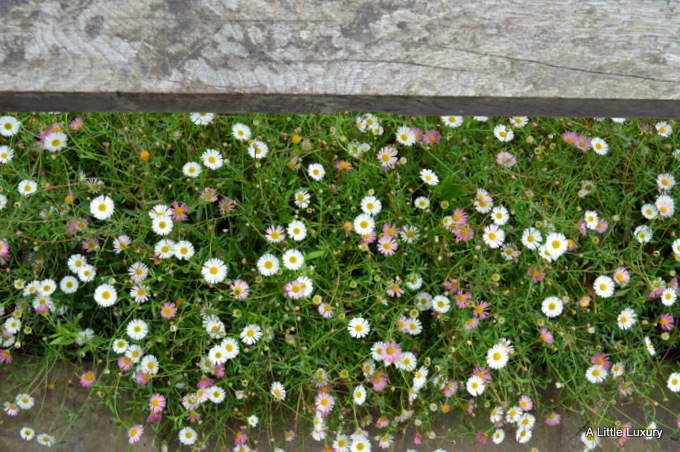 I went for Mexican Fleabane because I am hoping it will spill out the top of the pot and cover the edges. Here’s a picture of Mexica Fleabane when it really gets going so you can visualise the effect I’m going for. 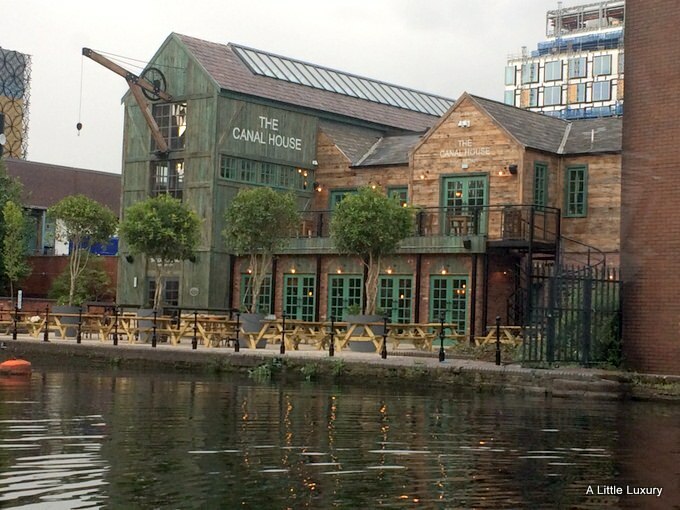 This week I went on a voyage of discovery to the The Canal House. I can remember the James Brindley pub opening up in the 1980s and it was very popular for quite a while, but recently the building has been closed and looking a little sorry for itself. So when I heard the news that the people behind The Botantist had taken it over, it was good to know that new life was going to be breathed into the place. I was delighted to be invited along to try out their food and drink selection with a few friends. We set off appropriately enough on a narrow boat and approached The Canal House from the water. Along the way we were treated to a beer tasting and heard about the lengths The Canal House is going to, to get the best beer for us. The Canal House will have more than 60 unique world ales, including Budvar’s unique unpasteurised full-flavour tank beer Tankové Pivo, that’s matured for 90 days. The beer remains fresh because it’s speedily delivered in temperature controlled tanks that are airtight to provide the freshest beer possible. This was the first time I’d been on a beer tasting event (let’s hope it’s the first of many). I am a natural bitter drinker and I tend to steer clear of paler beers especially lager. So I was unsure if I would like the selection we tried as there were two pale ales. 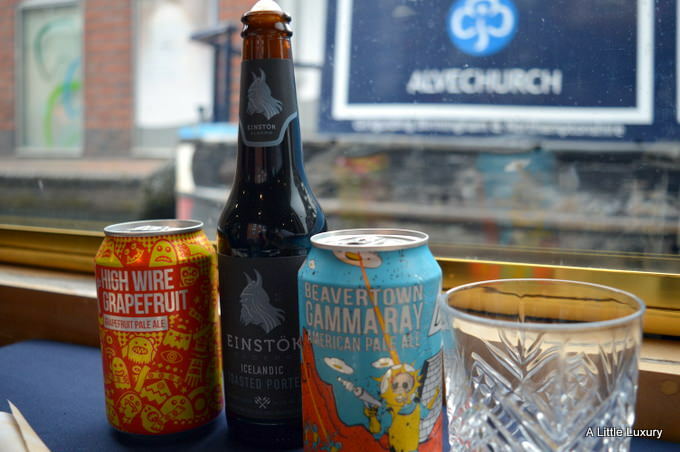 The first was Beavertown Gamma Ray which is an American style Pale Ale, but it’s brewed in London. It uses whole leaf American hops and lots of them to create its unique flavour. To be honest this one wasn’t for me, although I did feel it had more depth than the average Pale Ale. The rest of my party thought this beer was the best we tasted, but they all prefer paler beers to me. Next up was High Wire Grapefruit from Magic Rock Brewing was next. This was a bit of a revelation to me: a Pale Ale that I would actually order out of choice in a bar. The pink grapefruit provided the necessary sourness needed to make this a well-rounded beer for me. This was my favourite of the bunch. Next up was the Einstök Icelandic Toasted Porter. I do generally find Porters a bit heavy-handed for my taste buds, but I’d choose a Porter over a Pale Ale generally. This Porter had dark, smoky, complex flavours and it had almost a toffee taste. I found it a little sweet, but I liked the depth of flavour. Before very long at all we were pulling up to our destination. The Canal House is certainly looking good now it’s had a refurbishment. It’s now a lovely part of the canal scene and a great place to sit outside and enjoy a summer’s afternoon. On arrival we started out on the food. 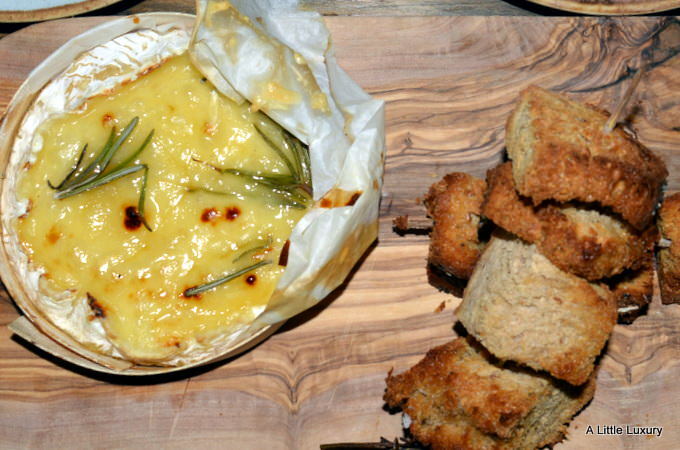 The Baked Camembert Starter seemed an obvious choice and it was truly delicious. It came served with honey, fresh rosemary, skewered granary croutons which were toasted but still quite soft and perfect for spreading the soft cheese on nice and thickly. It also came with Braeburn apple wedges which is a great combination with the camembert. 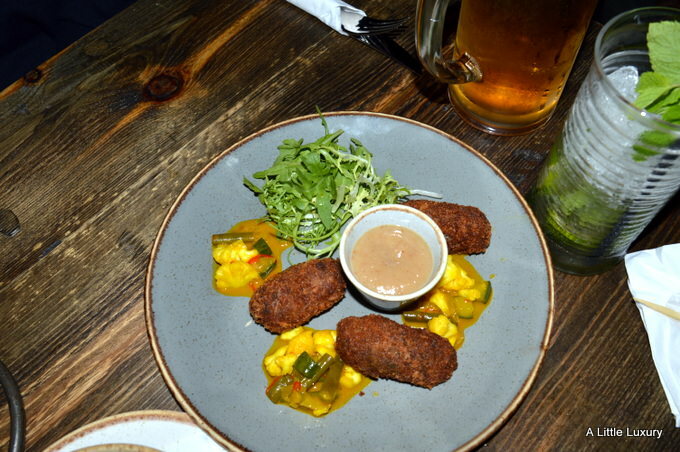 Another favourite from the starter menu for our table was the Rotisserie Pork and Black Pudding Fritters served with apple and fig ketchup, plus homemade piccalilli. For main courses we all had the Hanging Kebabs because they looked so amazing. 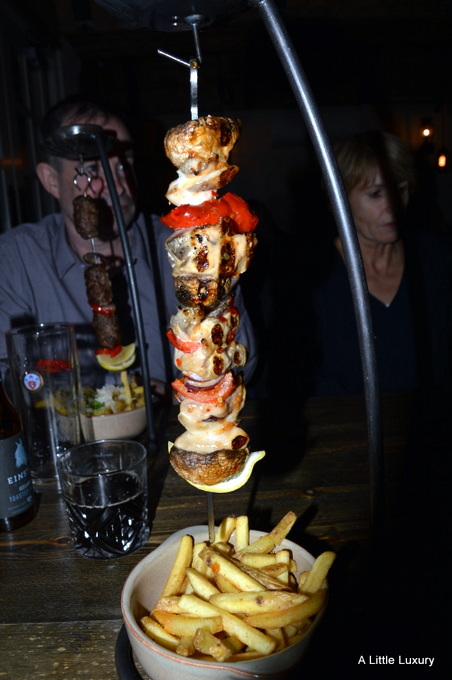 I picked the Chicken Hanging Kebab with garlic butter and properly seasoned chips. When the kebab was brought to the table, it came topped with a small dish of garlic butter. We asked the waitress to pour this over the kebab for us and it infused the kebab and the chips with a wonderful garlicky flavour. We tried a few of the cocktails too. This was my personal favourite of the ones we tried. It’s a mojito with dark rum rather than white rum. 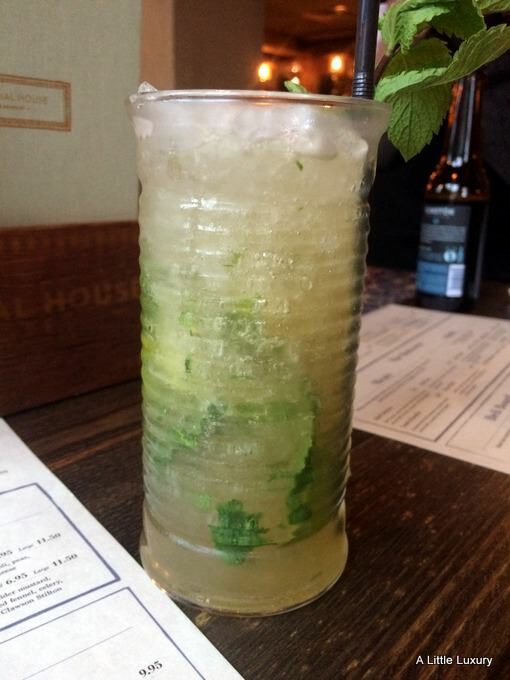 As you’d expect the mojito is very refreshing, but the addition of dark rum adds depth and flavour. The Canal House opens to the public on August 14th 2017. I think I’ll be going back. I’m always on the look out for something new in the snack department and even better if it’s something healthy. 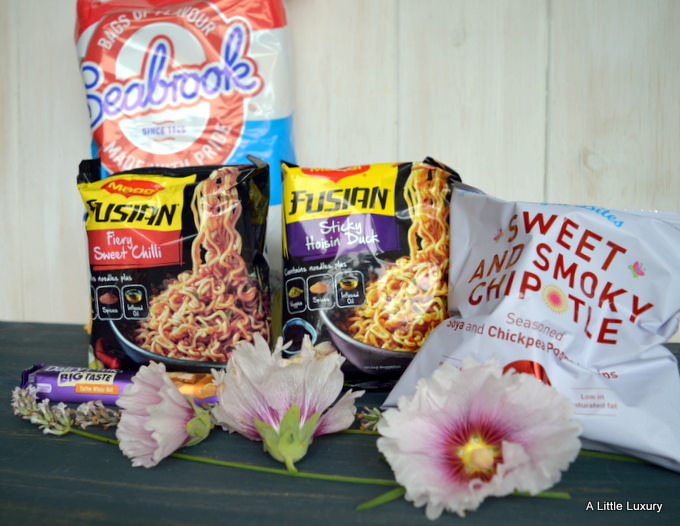 Chika’s recently got in touch and asked me to review some of their products. 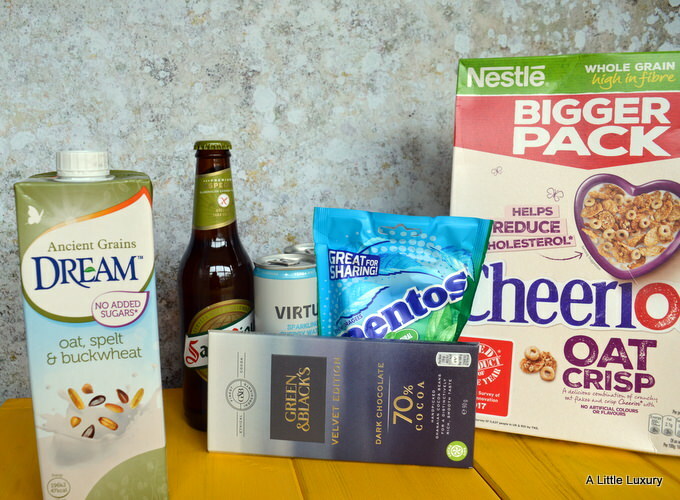 Their snacks are made with absolutely nothing artificial, baked gluten-free, lower in salt and fat, plus they are vegetarian or vegan (depending on the variety). It certainly makes you feel better after you’ve eaten the packet! I also like that they don’t use palm oil or GMO. 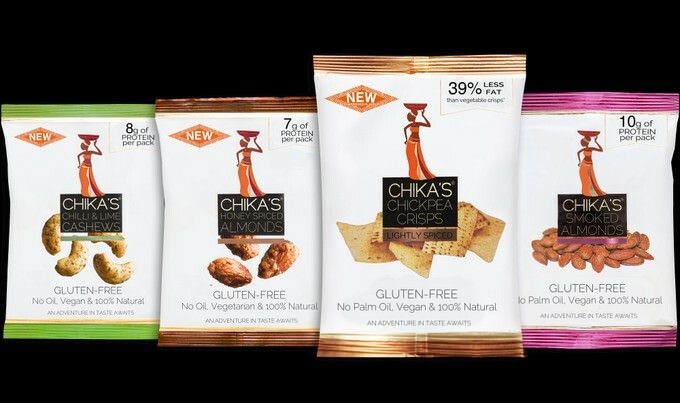 Chika’s offer a range of nuts including Honey Spiced Almonds, Chilli & Lime Cashews, and Smoked Almonds. My pick of the bunch were the Chilli & Lime Cashews which had just the right balance between chilli heat and the zing of the lime to lift the nuts onto another level. The only trouble is that they are very moreish. I’ve also been liking the Chickpea Crisps. These don’t have the fattiness of normal crisps, in fact they use a third less fat than vegetable crisps. They are spiced to add a taste of West Africa and they achieve that with spices like cumin rather than adding salt. I have a month’s supply of 2 packs each of Honey Spiced Almonds, Chilli & Lime Cashew, Smoked Almonds, and Lightly Spiced Chickpea Crisps for one lucky winner. Enter via the Gleam widget below. 2. Entrants must be UK residents aged 18 years or older. 6. Competition closes on 27th August 2017. Olives aren’t for everyone, but I’ve developed more of a taste for them over the years. I love that these OLOVES come in handy packs and the stones have been removed. Just olives seasoned with a little chilli, garlic and oregano. 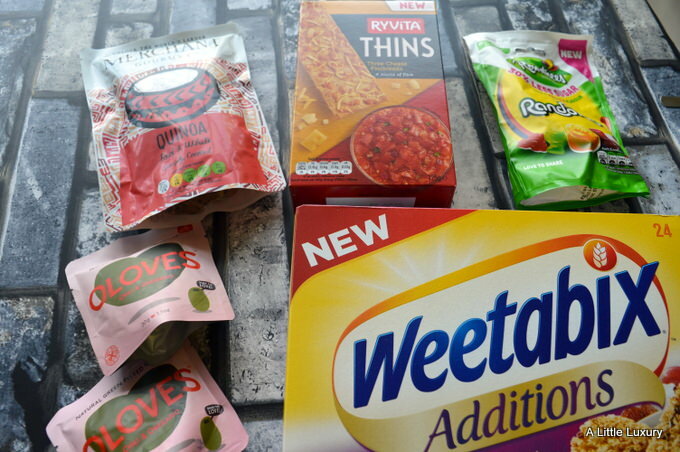 For a summer snack there’s Ryvita Thins Three Cheese in this summer Degustabox. They are topped with cheddar, regato and emmental cheeses – mmmm! I find these Merchant Gourmet Simply Cooked Red & White Quinoa perfect for getting a quick lunch together. I also like the fact that Weetabix are jazzing up their traditional cereal with this Weetabix Additions Coconut & Raisin variety. Another little treat was the Rowntree’s Randoms 30% Less Sugar are a perfect treat to share – we used ours to keep children going on a long walk. Blossom Hill Spritz is the perfect accompaniment to a long summer evening. Serve nicely chilled and I quite like serving it with ice too. This is a lovely light drink because of the mixture of fruity flavours with the wine. 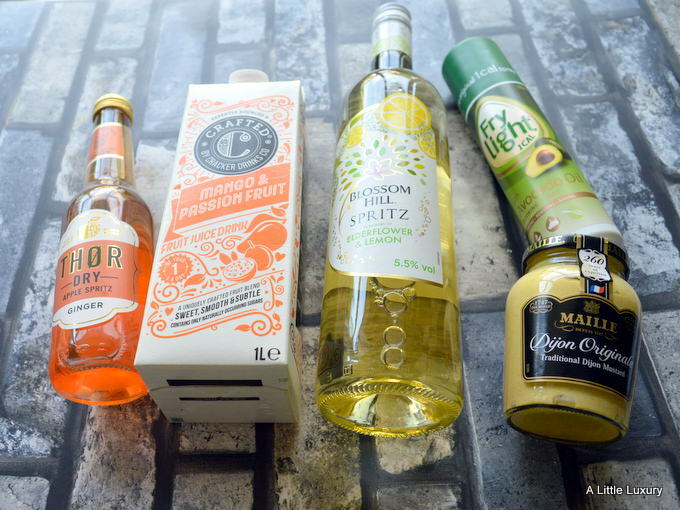 I tried the Elderflower & Lemon version which was very refreshing. Another drink with a fruity flavour is the Crafted Mango & Passionfruit Fruit Juice Drink and again I’d recommend serving it chilled and over ice. A very welcome surprise was the full price voucher for a tub of The Collective’s yoghurt. After trying their yoghurt through a previous Degustabox voucher I’ve become a bit of a fan, so I’m keen to give The Collective Kids Big Tub Yoghurt a try. THOR is another brand we’ve tried before through Degustabox. I’m loving the Apple Spritz with its ginger zing. Also, in this month’s box, we’re trialling Maille Dijon Original mustard that I plan to team up with a nice steak. For cooking I’ve been using this Frylight Cooking Spray with Avocado Oil. I’ve been impressed how little I have to use and it works well with a range of different cooking techniques.